The matter that faces us now concerning the United Nations Food and Agriculture Organisation (FAO) is: how should we consider what its activities represent? Like other UN agencies, the FAO works according to a mandate, which is agreed upon by its member states. Where the FAO is concerned, that mandate has to do with agriculture, not in the form of crops produced per hectare or acre, but in terms of who the cultivators and growers are, what their living and working conditions are, and the manner in which the crop and food they produce reaches the hands of those who need it. Looked at in this way, an organisation such as the FAO has as one of its responsibilities the provision of support, in as many ways as possible, of the majority of those who grow food and the majority of those who buy food. In recent years however, the UN FAO has set aside this responsibility, deliberately and according to a plan. This dereliction of duty – in fact it is a duty agreed upon by FAO member states, of which there are 197 – can only be explained in one way: the FAO of today no longer represents the smallholder cultivator and farmer and peasant, and no longer represents the rural communities for whom agriculture is a dominant part of their biocultural life. If the FAO now functions as an industry association (that is, representing the interests of a range of industries and technologies within the agriculture and food sector) then that is the choice of the organisation, presumably with the consent of the member states. However, such a deviation from its role hitherto then calls into question the funding it receives from said members, for that funding has for the 70 years of the organisation’s existence been predicated upon the FAO fulfilling its responsibility towards smallholder and peasant farmers, wherever in the world they may be. If the FAO is today an industry organisation – which its recent actions proclaim it to be – then the 197 member states must stop giving the organisation an annual contribution. Will such a cessation of financial support make a difference to the FAO of 2016? Let us examine how the organisation is funded. The total FAO Budget planned for 2016-17 is US$ 2.6 billion. Of this amount, 39% comes from contributions paid by member countries, whereas 61% is to come from what are called “voluntary contributions from members and other partners”. Some countries pay more than others, some very much more, some not at all. The USA maintains an outstanding towards the FAO that is ludicrous – it is US$ 96.97 million in arrears. But what is of concern to us is the alteration in the balance of the members’ contributions and the so-called voluntary contributions, in the rough ration of 40 to 60. This means that 6 out of 10 dollars that the FAO receives is used for what the organisation calls “support technical and emergency (including rehabilitation) assistance to governments for clearly defined purposes linked to the results framework” and which is different from the activities provided for under the “regular budget”. Under the circumstances that I have just described therefore, the FAO-hosted international symposium, titled ‘The Role of Agricultural Biotechnologies in Sustainable Food Systems and Nutrition’, which is under way 15-17 February 2016, is what any trade organisation would call an interest group gathering with an intent to change policy and practice in a manner that profits and benefits the members of that interest group. It is opaque to us for now, based on the information provided by the FAO on this symposium, whether the money spent on transporting to Rome “over 400 scientists, representatives of government, civil society, the private sector, academia, farmers’ associations and cooperatives” for a conference to “explore how agricultural bio-technologies can benefit family farmers, particularly those in developing countries, who need to improve nutrition and food systems while facing the challenges of poverty, climate change, and population growth” – whether the money spent to do so comes out of the regular budget or out of a voluntary contribution. An answer either way must only lead to further very critical questions asked of the FAO senior management. These questions must be asked of FAO at all levels – particularly in FAO member states whose contributions to the organisation’s regular budget may be minuscule, but whose food and agriculture line ministries and departments, whose institutions and laboratories are induced or coerced into accepting an “inter-governmentally mandated package of best practices” that does everything to help the international agriculture biotechnology and industrial crop cultivation corporations and traders, and nothing whatsoever for those member countries’ peasant and smallholder farmers. What the FAO is doing with this bio-technology symposium is worse than unconscionable and worse than being wilfully unmindful about the evidence of the harm – to animal populations, ecosystems and humans – caused by biotechnologies and especially those employed for agricultural purposes. The serious harm to health and the ecological and agronomical impacts of glyphosate and glyphosate tolerant crops for example are the most thoroughly researched. The same kind of evidence has now emerged for Bt crops and Bt toxins. Evidence that genetic modification per se is harmful is as broad and unimpeachable, with the uncontrollable processes of genetic modification having led to the phenomena of antibiotic resistance (reported from all over the world), the creation of new pathogens, the incidence of cancers, and the hijacking of the human body’s natural nucleic acids to do harm. It is deliberately misleading and deeply cynical for the FAO to claim, with a banal insouciance, that this symposium “focuses mainly on the broad range of biotechnologies that could result in yield increases, better nutritional qualities, and improved productivities of crops, livestock, fish and trees benefitting family farmers and their food systems, nutrition and livelihoods”. This is the sort of cartoonish PR piffle that the UN sustainable development goals (the SDGs) have been wrapped in to appeal to the social media tendencies of the world’s teenagers. For the last two years out of the four that José Graziano da Silva has been at the head of the organisation, the tilt towards industrial agriculture and biotechnology has become very much more pronounced compared with the already sorry condition the organisation was during the second term of Jacques Diouf (the Senegalese diplomat who was director-general from January 1994 to 31 December 2011). Under da Silva the “agriculture for nutrition” campaign line has become very much more prevalent, and has been supported – voluntary contributions facilitated by the FAO’s Partnerships and Advocacy Branch (an office by itself, and a very industrious one) – by a host of private sector networks and consortia whose interests encompass biofortification, pharmaceuticals, and agricultural biotechnologies. The symposium has been condemned fiercely and jointly by 42 international and regional organisations with 131 national and local organisations (173 in all) led by La Via Campesina, Grain and ETC Group. “It is clear that, through the FAO, industry wants to re-launch their false message that genetically engineered crops can feed the world and cool the planet, while the reality is that nothing has changed on the biotech front,” is Via Campesina’s statement which adds that GMO use “throws farmers off the land” while “the industrial food system that it promotes is one of the main drivers of climate change”. Grain, which works to support small farmers and social movements in their struggles for community-controlled and biodiversity-based food systems, has in its comments said that two of the FAO keynote speakers at the symposium are known proponents of GMOs, and the agenda and side events over the three days include speakers from the Biotechnology Industry Organization (a biotech trade group in the USA), Crop Life International (the global agro-chemicals trade association), DuPont (one of the world’s largest biotech seed companies) and CEVA (a major veterinary medicine corporation), among others. Just when the biotech companies that make transgenic seeds are merging, the ETC Group has stated (with Syngenta having agreed to sell itself and its technologies to the government-owned China National Chemical Corporation, or ChemChina, only a fortnight ago), “the corporate vision of biotechnology is showing up at FAO” with the symposium being “another attempt by multinational agribusiness to redirect the policies of the UN agency toward support for GMOs”. ETC Group has demanded that FAO put an end to biopiracy and to its support for genetically modified crops, but as I have outlined earlier, the biotechnology purveyors in the FAO will have none of it because the structures of funding and control have been altered perhaps beyond the reach of the organisation’s member states. What is left to do? Proscribe the UN FAO for its anti-small farmer and anti-peasant activities, encourage members states to demand that FAO mend its ways or step out of the organisation, and meanwhile demand that governments central and local ban all environmental releases of GMOs and synthetic biology. As the 173 signatories to the statement on the symposium show through their work, action can be taken locally in communities, villages, towns, municipalities, regions, as well as nationally and globally. As for the benighted symposium, here is a news article by FAO on the conference, this is the page for the event, the brochure, summaries of presentations (which provide one more confirmation of the fundamentally destructive intentions of the biotech industry), and a ‘key messages’ sheet from FAO whose manner and attitudes betray the extent to which an industrial mind now runs this particular UN agency. More scientists, physicians and legal experts have signed the group statement issued by the European Network of Scientists for Social and Environmental Responsibility (ENSSER) on the safety of genetically modified organisms (GMOs). The number of initial signatories to the statement, titled ‘No scientific consensus on GMO safety’, was almost 100 on the day it was released, 2013 October 21, and has more than doubled since. Regarding the environmental risk of GM crops, ENSSER has said, the negative effects now documented empirically have been predicted since about 25 years. For instance, while naturally occurring Bt toxins come in a diversity of variants, GM crops necessarily have to choose one Bt toxin to be transferred, significantly enhancing the probability of resistance development. Such effects are analysed by community ecology researchers and not visible on the genetic level. The signatories have said they “feel compelled to issue this statement because the claimed consensus on GMO safety does not exist. The claim that it does exist is misleading and misrepresents the currently available scientific evidence and the broad diversity of opinion among scientists on this issue. Moreover, the claim encourages a climate of complacency that could lead to a lack of regulatory and scientific rigour and appropriate caution, potentially endangering the health of humans, animals, and the environment”. ENSSER members and non-members alike who have signed the statement have collectively said that science and society do not proceed on the basis of a constructed consensus, as current knowledge is always open to well-founded challenge and disagreement. They endorse the need for further independent scientific inquiry and informed public discussion on GM product safety and urge GM proponents to do the same. Regarding the safety of GM crops and foods for human and animal health, a comprehensive review of animal feeding studies of GM crops found that most studies concluding that GM foods were as safe and nutritious as those obtained by conventional breeding were “performed by biotechnology companies or associates, which are also responsible [for] commercialising these GM plants”. 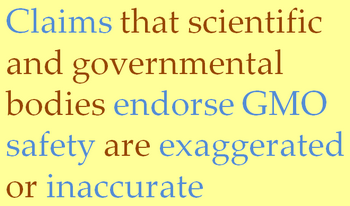 It is often claimed that “trillions of GM meals” have been eaten in the US with no ill effects. 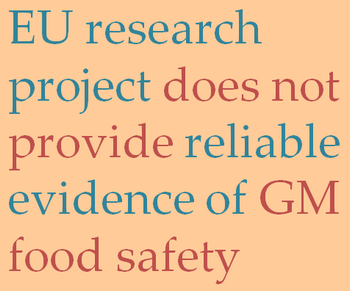 However, no epidemiological studies in human populations have been carried out to establish whether there are any health effects associated with GM food consumption. As GM foods are not labelled in North America, a major producer and consumer of GM crops, it is scientifically impossible to trace, let alone study, patterns of consumption and their impacts. Therefore, claims that GM foods are safe for human health based on the experience of North American populations have no scientific basis. A report by the British Medical Association concluded that with regard to the long-term effects of GM foods on human health and the environment, “many unanswered questions remain” and that “safety concerns cannot, as yet, be dismissed completely on the basis of information currently available”. 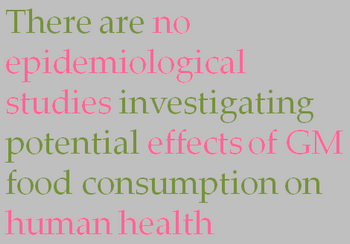 The report called for more research, especially on potential impacts on human health and the environment. Likewise, a statement by the American Medical Association’s Council on Science and Public Health acknowledged “a small potential for adverse events … due mainly to horizontal gene transfer, allergenicity, and toxicity” and recommended that the current voluntary notification procedure practised in the US prior to market release of GM crops be made mandatory. The ENSSER group has said that even a “small potential for adverse events” may turn out to be significant, given the widespread exposure of human and animal populations to GM crops.